Nick Collins’ films consists of an indeterminate, poetic, and observational statement that, combined with a phenomenal sensitivity to light, movement and stillness - offers a space for reflection on landscape, cinema, sound and image. 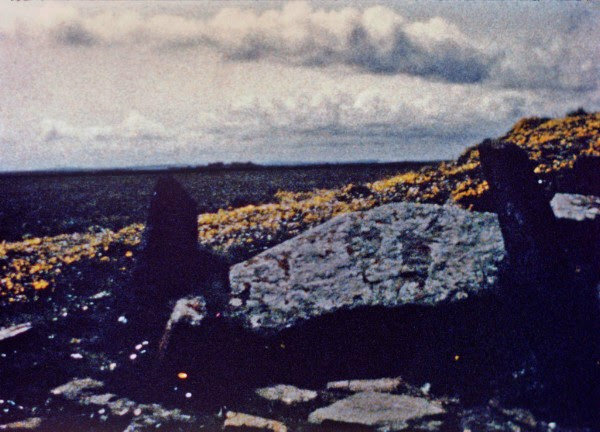 For example, Sanday (1988) was shot on an island in the Orkneys, and superficially it recalls the photographic work of Hamish Fulton in the choice of remote and empty landscape, with the stillness that that implies. Hilltop with Clouds (2014) concentrates on a rocky ridge high up in the Cévennes mountains, directly above the location of the Mimente river in southern France there Collins made the film Mimente (2008): which mainly focus on reflections, shadows and an exploration of film movement and time. In the three part series Trissákia (1994-2013) Collins documenting a ruined Byzantine church in the Mani, Laconia, Greece, and in Tholos (2009) a Mycenaean tomb at Nichoria in Messenia, Greece. "Dark Garden" was shot with a single light source in a garden during a winter's night, and is a combination of views that combines deft superimpositions and focus-pulls to resolve transient imagery of the garden's deciduous plants. "Cornish Winter Reeds and Skies" brings together landscape imagery, a fragmentary story and a certain orientalism. "Winter into Spring" is about how difficult it felt to ‘breathe' in the midst of the 1980s capitalist revolution in the UK. Reflections, shadows and an exploration of film movement and time, shot on/in a 100-yard stretch of the Mimente river in southern France. "Looking in and out: A Winter Diary" is a bit of a psychodrama, and centres on images which are projected onto and refilmed from a misted-up window. "Sanday" was shot on the eponymous island in the Orkneys. The film is in four sections, each representing (and transforming) my actions in and experience of a place at a particular time. Drawing on the qualities of these places and the long history of human habitation of the landscape (evidence for which goes back to 3500 BC), my intention was to make possible the experience of a series of linked mental/emotional states, seen through a landscape and movement within it. "Trissákia" documenting a ruined Byzantine church in the Mani, Laconia, Greece. "Tholos" focus on a Mycenaean tomb at Nichoria in Messenia, Greece. The core in "Trissákia 3" is a building which has stood since at least the fourteenth century, its contents, and a strange attempt at preservation. Light falls into the dark interior, illuminating it directly and by reflection; at the same time the decay of the building offers views out. An ancient structure and a modern one interact as the sun works its way round each day. "Hilltop with Clouds" was filmed on a rocky ridge high up in the Cévennes mountains, directly above the location for the film "Mimente". In collaboration with Cinema Galeries, Brussels. Cinema Parenthèse is a platform in Brussels, Belgium that invites alternative filmmakers and screens films in their original format. The screenings are based on a dialectical montage, the collision between single films and different film programmes, an ongoing series about investigating different film strategies in political and aesthetic manners.